This is a collection of clever and sometimes humorous ideas geared toward the dog owner who is seeking a little something more in a name. To figure out exactly what makes a name brilliant or bland, we will take a look at some common selections and where they fall short. Most typical options can be broken down into one of two major categories. Human-turned-dog is the first variety. These are ideas taken directly from people. While there is some potential, this is often a lazy approach that prevents a person from having to come up with something truly unique and interesting. If many people bear the same name, odds are that nobody will take notice. A second type is the notoriously short word that is easy to say. Spot is a perfect example. It is a very typical idea that won’t strike a key in everyday conversation. In fact, you could replace ‘Spot’ with ‘my dog’ and get the same level of response. In order to avoid the pitfalls of these two approaches, we need to focus on finding words that draw attention. Being original is the best way to accomplish this. The first time that a person encounters a new name it will interrupt and hijack their thought process. It is at this point that whatever you choose needs to have a hook. The hook seals the deal by making them think. It could be a pun, irony, or just something funny. The best choices will tie in to your puppy through personality or appearance. 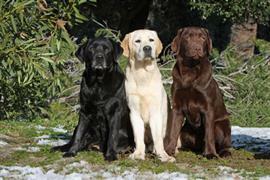 Since we don’t know your dog, we have provided many ideas that cover a variety of canines. Some of our pages will contain a subcategory. A subcategory is a slightly more specific grouping than the main topic of the page. For a subcategory, we will include a separated table of names and corresponding descriptions. An example of a subcategory of Red Dog Names would be 'Dog Names Inspired by Red Wines'. If you have any subcategory ideas for the Witty Dog Names page, we would love to hear them. Use the form below to submit your ideas.